When caregiver Faith McCallum arrives at the enchanted, lakeside estate of Avalon’s renowned Bellamy family, she’s intent on rebuilding her shattered life and giving her two daughters a chance at a better future. But she faces a formidable challenge in the form of her stubborn and difficult new employer, Alice Bellamy. While Faith proves a worthy match for her sharp-tongued client, she often finds herself at a loss for words in the presence of Mason Bellamy—Alice’s charismatic son, who clearly longs to escape the family mansion and return to his fast-paced, exciting life in Manhattan…and his beautiful, jet-setting fiancée. If you are expecting an epic romance set in an idyllic location, you may want to pass on this book, but if you want to read a poignant and moving story of physical and emotional healing, then this is the story for you. 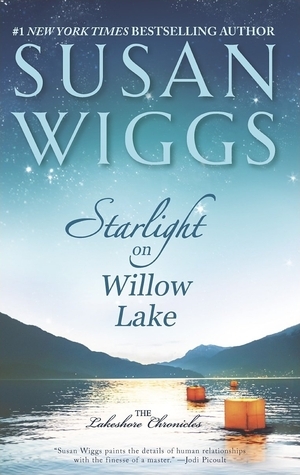 STARLIGHT ON WILLOW LAKE is a great story of healing, both physical and emotional: the mother facing destitution gets a new lease on life and security for her children; the family fractured by both recent events and long-held secrets; the son who always idolized his father forced to keep his father’s indiscretions secret to avoid hurting his mother, with the result being a distance from his family and a distortion of his views of marriage and family and a woman who has already lost so much finding out that most of her marriage may have been a lie, a fresh loss by itself. Mason Bellamy lost his father to a skiing accident that left his mom a quadriplegic and finding a nurse aide that would stay has been a very difficult thing to do. Mason is willing to pay anything to get his mother the help she needs as long as this would give him the freedom to return to his job in the city and Faith McCallum is the key to achieving that goal. However, Mason’s desire to keep his distance takes a hit when it comes to light that his mother’s most recent mishap at home may have been more than an accident. Alice Bellamy lost everything when she lost the use of her limbs in the accident and she’s been bitter and angry since then, but the recent information she received may be the last straw for her as everything she believed in appears to be a lie. The arrival of Faith and her daughters may be just the thing to get her mind off her situations as she takes an interest in Faith’s daughters and forms a bond with Faith’s younger daughter and pretty much becomes something of an honorary grandmother to her. Faith has spent most of her life in crisis mode, from dealing with her chronically ill mom to her chronically ill husband and the threat of financial ruin almost was too much until the job with the Bellamys. She is just content having a roof over her family’s head and falling for Mason is definitely not a part of the plan, especially because he’s both her employer and also engaged to his girlfriend. Mason finds himself forging a bond with Faith over his mother’s care and opening up about secrets he’s been keeping for decades. Their easy friendship deepens into something more and both must decide if they are willing to open themselves up to love and everything that comes with it, both good and bad. There are so many layers to this story and the simmering tenor of the romance between Faith and Mason fits in very well with the overall tone of the story. What struck me the most was that from all of the losses these people had been through, they formed their own small family, not just based on blood but a family based on love and shared experiences. STARLIGHT ON WILLOW LAKE is definitely a story everyone must read. Creating family, CHOOSING family, is a theme I love to read about, and something that I strive to do in my own life.